Creativity champion. Civic educator. Public defender. Tom Tresser is an educator, organizer, creativity champion, public defender and fighter of privatization. He has doing civic engagement and grassroots democracy efforts for over 40 years. His first voter registration campaign was in 1972. Tom has acted in some 40 shows and produced over 100 plays, special events, festivals and community programs. He was director of cultural development at Peoples Housing, in north Rogers Park, Chicago, where he created a community arts program that blended the arts, education and micro-enterprise. Tom was elected to the Abraham Lincoln Elementary School’s Local School Council and served from 2004 to 2006. He was a co-founder of Protect Our Parks, a neighborhood effort to stop the privatization of public space in Chicago. He was a lead organizer for No Games Chicago, an all-volunteer grassroots effort that opposed Chicago’s 2016 Olympic bid. He has taught workshops on “The Politics of Creativity – A Call To Service”for arts service organizations in six states. He teaches a number of classes on creativity, public policy and civic engagement for Loyola University, School of the Art Institute, the Illinois Institute of Technology, DePaul University and for i c stars. Tom has published a web-based project, “America Needs You!” – about the need for creatives to lead in the public sector. Tom was the Green Party candidate for the position of President of the Board of Commissioners of Cook County in November 2010 election. Tom is extremely proud to announce the launch of a new civic project, The CivicLab, a co-working space where activists, educators, coders and designers come to work, collaborate, teach, and build tools for civic engagement. The space is located in Chicago’s West Loop at 114 N. Aberdeen. He is the lead organizer for the TIF Illumination Project that is investigating and explaining the impacts of Tax Increment Financing districts on a ward-by-ward basis. Tom and the TIF Illumination Project are profiled in the cover story of the July 22, 2013 issue of The Nation entitled “Chicago Rising!” He has presented on how TIFs impact neighborhoods all over the city. 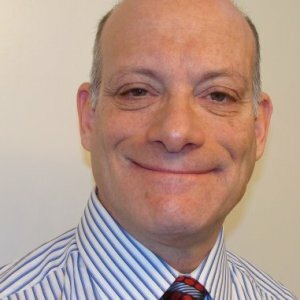 Listen to this 47 minute podcast where Tom is interviewed about his background, civic work and the connections between creativity and democracy - http://tinyurl.com/Podcast-ADMCi. 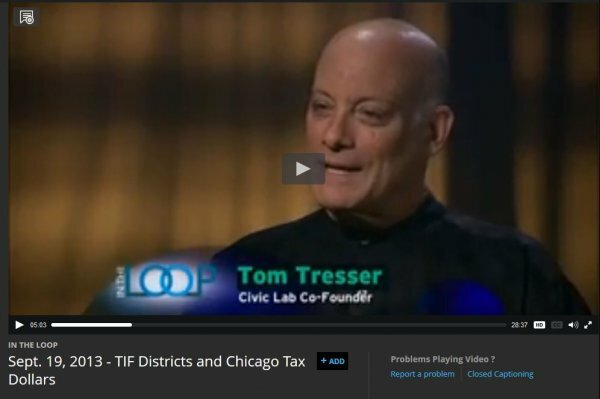 CivicLab co-founder Tom Tresser was one of three experts included in Chicago Public Radio's "Curious City" segment on Tax Increment Financing (TIFs). He appeared with Cook County Clerk David Orr and University of Illinois professor Dr. Rachel Weber. 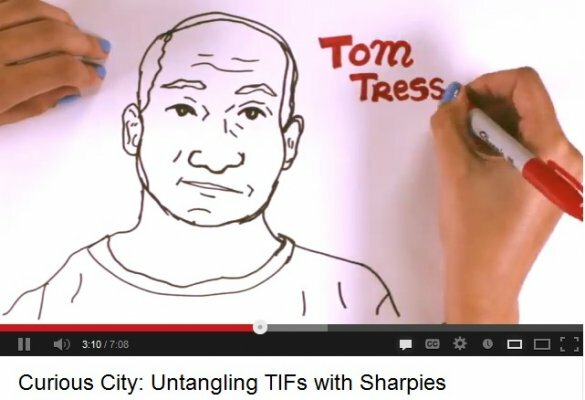 TIF Illumination Project (http://www.tifrepoprts.com) lead organizer Tom Tresser was featured in this segment on taxes and TIFs. 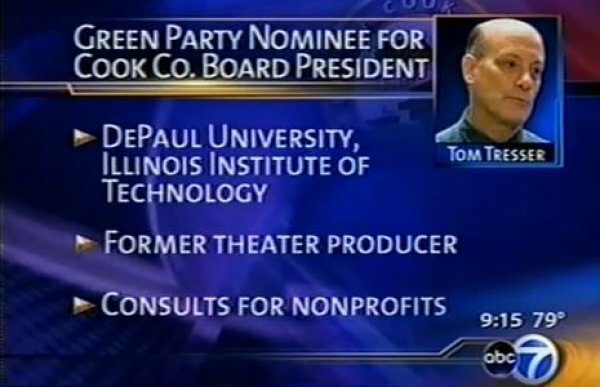 Tom was the Green Party candidate for Cook County Board President in the November 2010 election. This is a 12 minute segment from the ABC News Chicago program, "NewsViews." 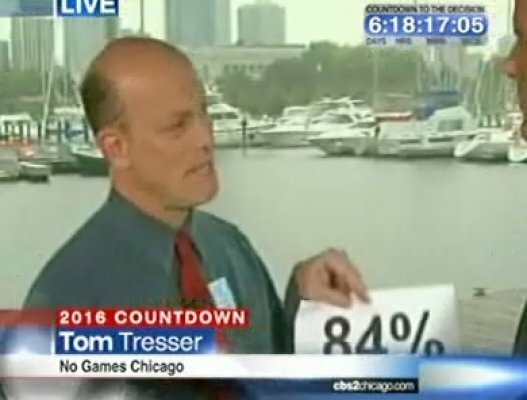 Tom Tresser, a co-leader of No Games Chicago (http://www.nogameschicago.com) is interviewed a few days prior to the IOC's vote to award the 2016 Summer Olympic Games. 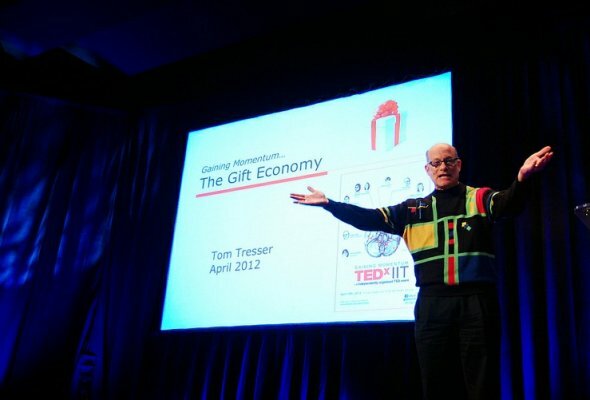 Tom Tresser (http://www.tresser.com) gave this presentation on the Gift Economy at TEDx IIT 2012 on April 14, 2012. We actually created a pop-up Gift Economy by asking attendees to post things that they would give and requests for things needed. 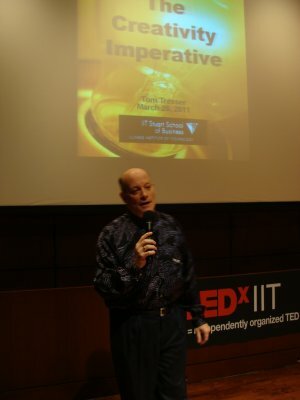 Tom Tresser (http://www.tresser.com) gave the talk, "The Creativity Imperative - Why Creativity Is Job #1 For You & Your Organization" at TEDx IIT on March 26, 2011. 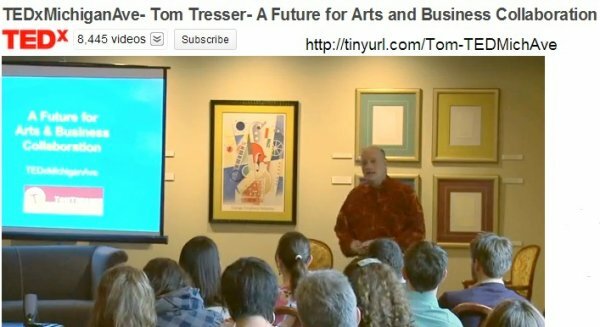 Tom Tresser (http://www.tresser.com) gave this presentation on a possible future for arts and business collaboration at TEDx Michigan Avenue, May 7, 2011. Tom took the position that business has more to learn (and profit) from the arts community than the other way around. Moreover, the creative mindset and studio thinking offers practice and values that can rescue the planet from the over-reaching greed and self-interest of business that is plundering the planet. Seriously. All about Tax Increment Financing (TIF) districts work in Chicago. This is a 50 minute talk that details the history of TIFs in Cook County and describes the citizen-powered TIF Illumination Project (http://www.tifreports.com) that combines data mining, investigatory journalism, map making, graphic design and community organizing to reveal the details of Chicago's half-billion dollar annual TIF program. 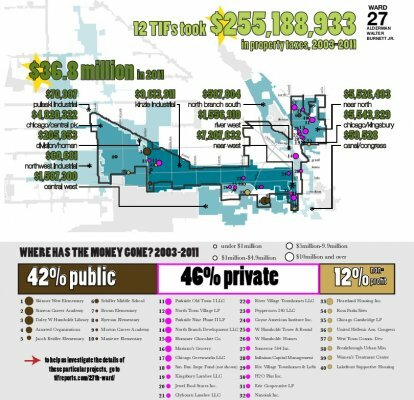 The TIF Illumination Project is a work of the CivicLab (http://www.tifreports.com) and combines data mining and graphic design to explore and expose the impacts of Tax Increment Financing districts on the people of Chicago on a ward-by-ward basis. We've done 25 public meetings since February of 2013 in front of over 4,000 people. Tom has taught a number of classes on civic engagement and leadership for i.c. stars (http://www.icstars.org), the University of Illinois at Chicago and the Stuart School of Business at IIT. Tom pioneered a class on creativity for the IIT Stuart School of Business that included portfolio work, experiential learning and visits to creative hotspots and visits from guest experts. Tom has started or led 13 nonprofit social enterprises to date. He has taught an online class on nonprofit management for the Loyola Graduate School of Social Work for a number of years. “I really enjoyed your course. This was my last class needed to earn my MSW. I learned more about NPOs than I ever imagined I would. I am excited to get out and soon be working in the NPO sector. Thank you for having such a tough and informative class!! !” – Student from Summer 2013. Details the launch and progress of the crowdsourced citizen-powered grassroots journalism work of the TIF Illumination Project (http://www.tifreports.com). Tom's career has been about creativity, democracy and community building. In the premiere issue of Artworks he lays out his reasons why artists and creatives should lead in public life, including dunning for office as Creativity Champions. This is a self-published manifesto which can be purchased in hard copy or downloaded as a PDF at no charge. It lays out the reasons why creativity should be a fundamental policy and political priority for America and why artists and creatives should seek leadership roles in public life - including running for local office.